Speakers from Greece and from those who occupied the London Greek Embassy in solidarity with the Greek resistance to the military coup. What Happened on April 21st 1967. Before dawn on April 21 1967 a far-right group of ‘colonels’ ripped apart Greek democracy. Some of them had supported the wartime collaborationist government under the Germans. All had supported the 1936-41 Greek dictatorship and fought against left resistance in the civil war of 1944-1949. When the upcoming elections looked likely to lead to another centre-left government (after King Constantine dismissed the 1965 one), the Colonels acted. 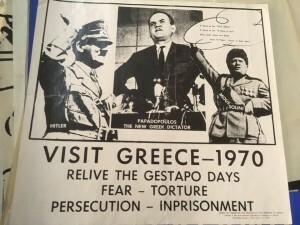 Tanks appeared at strategic points in Athens and some 8,000 leftists were arrested. Later that day King Constantine legitimated the Coup. He appointed a new prime minister who formed a military government. The Colonels issued a decree instituting military law, abolishing the constitution and cancelling the elections. It even became illegal to listen to music by resistance figures like Mikis Theodorakis and Melina Mercouri. Torture was commonplace : Torture was commonplace over the next seven years. At least 3,500 ‘guests’ passed through torture centres. Six thousand leftists were imprisoned or exiled to remote Greek islands. American Vice-President Spiro Agnew welcomed the junta as ‘the best thing to happen in Greece since Pericles’. The British Labour Government hesitated briefly and then recognised the coup and accepted Greece staying in NATO. In 1968, tanks changed the Prague government. In 1971 General Pinochet followed suit, killing Chile’s President Allende and thousands of Chilean leftists. 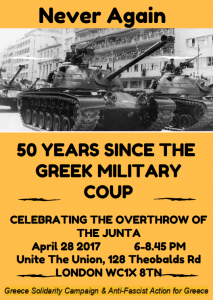 Resistance: Resistance to the Junta grew in Greece, particularly among students. On February 21 1973 they occupied the University of Athens against the forcible drafting of ‘subversive youths’. An occupation of Athens Polytechnic then sparked mass demonstrations and new military repression. On November 17 1973 24 students and demonstrators were killed and hundreds injured. In July 1974 the Junta staged a coup against the President of Cyprus, Archbishop Makarios, who had called for Greek officers to get out. This was followed by the Turkish invasion of the North of the island. 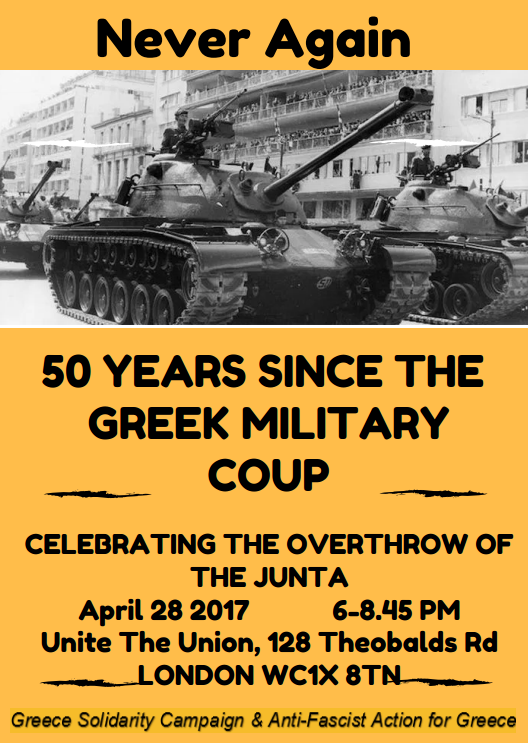 The Greek military’s role then caused mass defections from the Junta, which collapsed immediately. In December 1974 a two to one majority of Greek people voted in a referendum to establish the Third Hellenic Republic. November 17 then became a national holiday in schools and colleges throughout Greece. 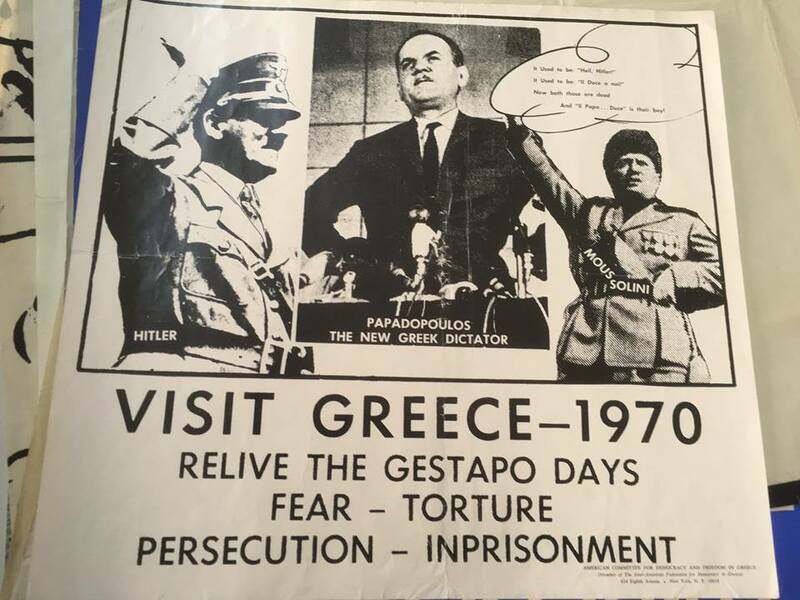 ( From an article by Steve Jefferys, then an LSE student who was one of those who occupied the London Greek Embassy in April 1967, originally published in Searchlight magazine). This entry was posted in Archive, Events, Fascism, News. Bookmark the permalink.